Nicandra physaloides, finds its extended phyto-geographical range from Deccan peninsula to part of Eastern Ghats in Odisha, India. The detailed description, correct nomenclature, ecological notes and distribution along with photographs of the taxon has been provided. Fig. : Nicandra physalodes (L.) Gaertn. 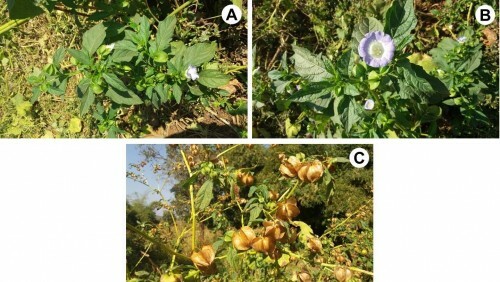 : A, Plant in natural habitat; B, Flower twig and unripe fruit; C, Ripe fruits.